NESTE post que fiz há uns tempos atrás, partilhei com vocês que ando à procura de um blazer preto e o update da situação é a seguinte: ainda não o encontrei e, apesar de ter experimentado imensos, nada me agrada. A verdade é que um blazer preto é um básico e, por isso, quero que seja perfeito. 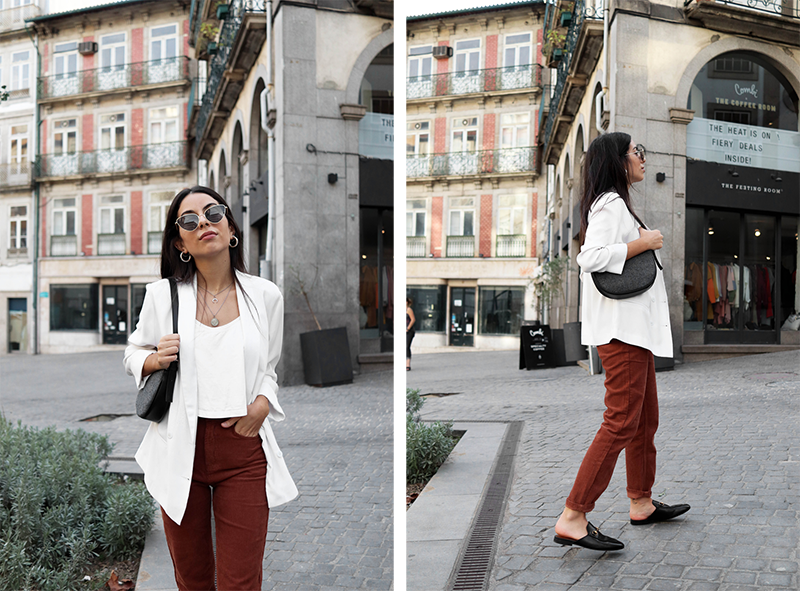 Portanto, o que procuro eu num blazer? On THIS post that I did a while ago, I shared with you that I'm in the hunt for a black blazer and the update is: I still haven't found it and from all the ones that I tried nothing feels right to me. The truth is that a black blazer is a basic piece so I want it to be perfect. So, what do I look for in a blazer? Primeiro de tudo, o corte é bastante importante para mim. Como já devem saber, o meu corte preferido é um corte mais masculino e, se for oversized, ainda melhor. Gosto de linhas simples e com um corte a direito. Também gosto muito dos casacos de abotoamento duplo, por isso gostava imenso de encontrar um blazer assim. First of all the cut is very important to me. As you know, I'm a fan of a more masculine fit and if it's oversized even better. I like simple lines with a straight cut. I also really like the double-breasted jackets so if I could find a blazer like that it would be perfect. A verdade é que já encontrei um blazer que gostei bastante e com o corte que eu queria, mas era 100% poliéster e, como sabem, isso é um grande não para mim. Por isso, o ideal seria encontrar um blazer 100% de algodão, mesmo que isso signifique pagar um pouco mais por ele. Afinal de contas, são nestes básicos que devemos investir, porque não me parece que um blazer preto alguma vez saia de moda. E, mesmo se sair (o que eu duvido), eu vou continuar a usá-lo de certeza. The truth is that I already found a blazer that I really like and with the cut that I love, but it was 100% polyester and as you know that's a big no for me. It would be perfect to find a 100% cotton blazer even if it means to pay a bit more for it. After all, it's on these basics that we should invest because I don't think a black blazer will ever go out of style. And if it does (which I really doubt) I will wear it anyway. Não é que eu não vá comprar um blazer porque não tem este detalhe como eu gosto, mas as lapelas são um pormenor importante num blazer e na qual eu também presto alguma atenção. Existem vários tipos, mas as minhas favoritas são as notch. São as mais comuns nos blazers de mulher, por isso não será difícil de encontrar um assim. It's not like I'm not going to buy a blazer because it doesn't have this detail that I like, but the lapels are an important detail of a blazer and something I also pay attention. There are different kinds, but my favourites are the notched lapels. These are also the most common on the woman's blazers so it won't be hard to find one like that. E é isto que eu procuro num blazer, se por acaso virem um assim, avisem-me! And there you go, that's what I look for in a blazer, if you see something like that, just let me know!